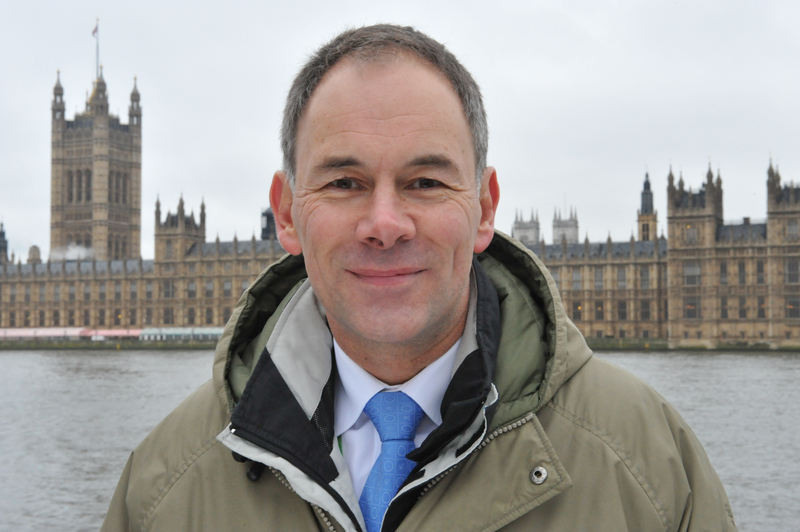 Greener Britain: Is there a winning technology? I recently participated in The Economist debate, Towards a Greener Britain: Is there a Winning Technology? The video is now available online. It was an interesting evening featuring a range of speakers from academia, the NGO community and industry (me). The question “Is there a winning technology” was posed to both the panel and the audience and for the most part the response was a list of such candidates as smart grids, CCS, wind power, electric vehicles and so on. There is no doubt that some combination of all these technologies will be part of Britain’s future, but identifying the winner is much more than just picking a favourite or guessing about where the world might head. As you will see from the video, I took a somewhat different perspective on the question and argued that the winning technology is the one that is most cost effective. This is what is really going to matter over the coming years, particularly as government budgets are strained to the limit and many family budgets likewise. Yet, at least in Britain, there are signs that we may not be going for the most cost effective approach at all. 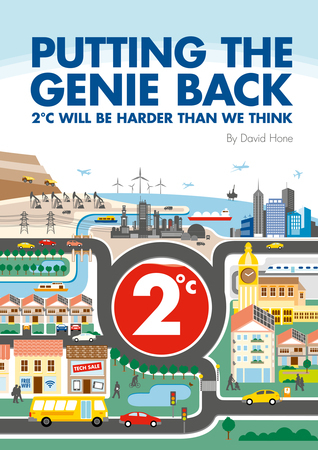 As noted in a recent post on this blog, the UK is proposing a carbon price bubble within the broader EU-ETS and the recent release of the 4th Carbon Budget proposal by the Climate Change Committee references a 60% reduction by 2030, by which time the UK will have a near zero emissions power sector (-91% according to the medium abatement scenario, below). This appears to be out of line with the EU proposals in its recently released 2050 Roadmap, where the power sector will have decarbonised by 54% to 58% by 2030 and won’t reach the levels desired by the UK Climate Change Committee until nearly 2050. This implies that the UK will have to maintain a set of policy measures to drive a change that isn’t aligned with the EU-ETS, which in turn implies a less cost effective outcome for UK consumers. Of course there is the possibility that the most cost effective reductions to be found in the EU are in the UK, but we can’t really know that in advance – hence the reason for choosing an emissions trading system as the principal policy mechanism for Europe, including the UK. The outcome for the UK is that it will be running ahead of the general EU trend, but the outcome for the EU is unchanged because EU allowance flow between the UK and the rest of the EU will re-balance the situation. 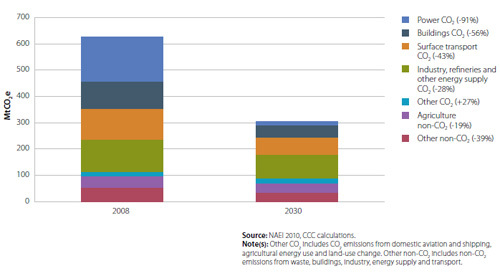 The UK may well get its zero emissions power sector, but at what cost? In terms of the most cost effective technology today, the current winner appears to be natural gas. As I illustrated for the US recently, natural gas backing out coal offers a relatively quick win for many economies and certainly is compatible with the EU 2030 goals. Longer term it must of course be linked with carbon capture and storage, so developing a natural gas plus CCS technology pathway is essential. In the shorter term gas also sits well with the many national targets to expand renewable energy given its ability to respond quickly to changes in electricity supply-demand during periods of peak load and/or low renewable electricity output. Finding the most cost effective route forward, whatever it may be, is the job of the EU Emissions Trading System. Without wanting to sound like a broken record (I have no idea what the 21st century MP3 version of that is), the ETS is here to stay and needs to be left to do that job. Even the recent argument for recalibration following the allowance surplus generated by the recession seems less relevant today following the German nuclear decision. 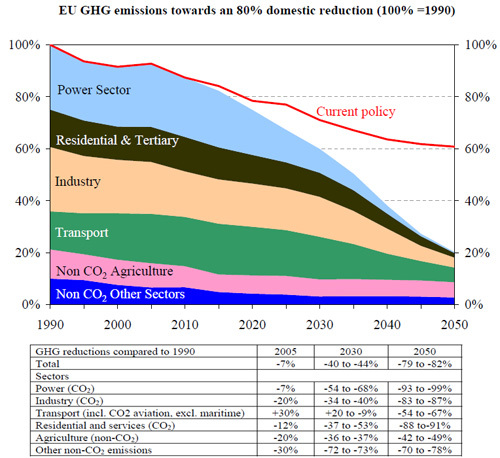 However, looking at the EU chart above, current policy (the red line) would appear to be insufficient for the desired 2050 environmental goal, so such proposals to make EU ETS more stringent in Phase IV should still be on the table for discussion. Our fate on the toss of a coin?